Ducati has released the first images of the MIG-RR electric bike. Developed in association with electric bike maker Thok e-bikes, the MIG-RR will go on sale in January 2019. 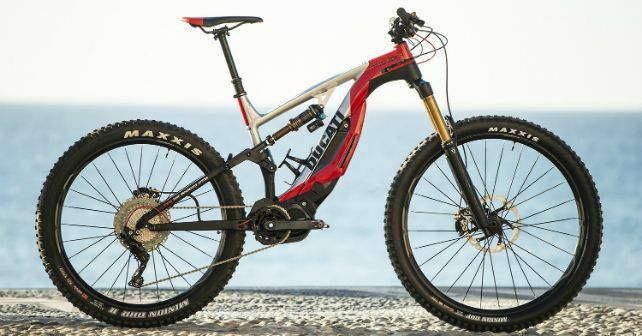 Electric mountain bikes have gained a lot of popularity in recent times, and Ducati wants to capitalise on it. The MIG-RR is powered by a Shimano Steps E8000 motor. The 504Wh battery has been smartly positioned under the lower tube to provide the bike with a low centre of gravity and thereby giving it increased stability. Ducati has sourced a lot of parts from specialists – the handle is carbon fibre from Renthal, the four-piston brake callipers from Shimano and, similarly, the suspension from FOX. The FOX Factory Karishma suspension has 170mm of travel at the front and 160mm of travel at the rear. The MIG-RR has been fitted with a 29-inch and a 27.5-inch wheel at the front and at the rear, respectively. What is the MIG-RR, though? It is Ducati’s solution to let you enjoy steep hill climbs with relative ease – the electric power ensures that. Lightweight and increased suspension travel further makes it off-road friendly. In fact, all the ‘support’ from the electric motor and the lightweight construction make mountain biking accessible to a larger audience as a sport. Thok e-bikes took birth out of the sheer passion Stefano Migliorini had for mountain bikes. The Italian started racing BMXs when he was 14 and soon secured the Mickey Mouse Trophy. He went on to win 10 Italian titles, three world cups and three European championships. Ducati has just released the images of the MIG-RR. The electric mountain bike will make its public appearance at EICMA 2018. There’s still no news of Ducati selling the MIG-RR in India, given the demand of electric mountain bikes in the country is rather limited.